You'll be £12.99 closer to your next £10.00 credit when you purchase Battle of the Bulge: Siege of Bastogne. What's this? With the Fifth Panzer Army fighting its way towards the River Meuse, the cross roads town of Bastogne, vital for the success of Hitler's last attempt to check the Allies in the west, the Americans rushed reinforcements to hold it. 101st US Airborne Division was resting in reserve near Paris when the call for immediate deployment to the Ardennes came and reached Bastogne just before the German ring around the town closed. Wearing only normal uniforms, the 101st joined the other garrison troops in a siege where they fought not only the enemy's panzers but the freezing, snowy, cold to hold the vital road junction. We take the viewers to the spot where the German commanders made vital decisions, to the trenches and woods where Easy Company battled and the road where the Germans received the message 'Nuts' in response for their surrender ultimatum. 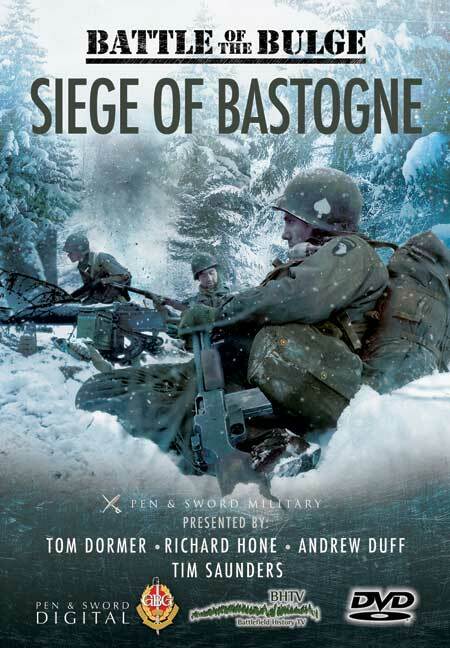 Finally, we will examine Patton's relief of Bastogne that concluding one of the great sieges of military history. As featured on JOEDEMADIO'S WW2 HISTORY & BATTLEFIELD BLOG.